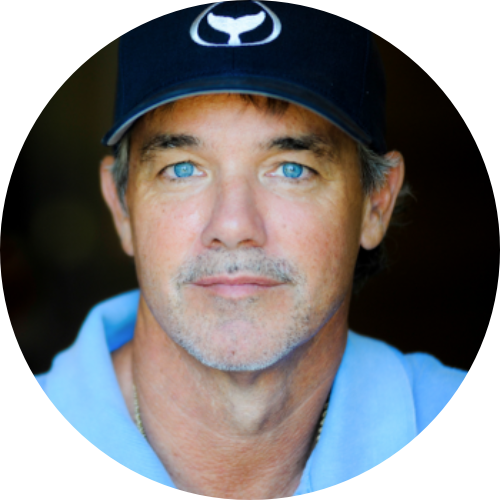 The marine wildlife artist, Wyland, was born Robert Wyland in 1956 in Detroit Michigan. He attended the Center for Creative Studies in Detroit majoring in painting and sculpture. Upon graduation, his professors, Jay Holland, Russell Keeter and Bill Gerard, recognized his talent and encouraged him to move to the California coast where he could further develop his art. Wyland, who paints in watercolors and oils, celebrates underwater sea life in his paintings and bronze sculptures. He is also known for his conservation efforts. In 1981 after being frustrated by his attempts to capture whales on canvas he painted his first public art titled, Whaling Wall. After garnering media attention for the artwork he embarked on a quest to complete 100 Whaling Walls by 2011 to raise public awareness of sea life. In 1993, he founded the Wyland Foundation to promote and protect ocean resources through life-sized public art, educational programs and support for environmental groups. In 1998 the United Nations proclaimed him official artist for the International Year of the Ocean.